The Being Aware About Biodiversity training program aims to build the awareness and capacity of council officers whose work activities may impact on terrestrial and aquatic biodiversity. The target audience for the awareness program is outdoor staff working in the field. Participants are gardeners, greenkeepers, labourers, team leaders and plant operators using mowers, tractors and poison units. Training is delivered as a one-day workshop with a morning classroom session and a field session in the afternoon. The workshop format covers the important issues of why biodiversity is important, habitat protection, chemical use and misuse, erosion and sediment control, council’s legislative responsibilities and some recommended daily practices to avoid harmful impacts on biodiversity in natural areas, parkland and waterways. Nine councils were directly involved in the development of this program including Ashfield, Auburn, Bankstown, Blacktown, City of Canada Bay, City of Ryde, Holroyd, Hunters Hill, Parramatta and Strathfield Councils. Raise the awareness of outdoor staff of the importance of biodiversity. Raise the awareness of outdoor staff about council’s legislative responsibilities in managing natural areas (terrestrial, riparian areas and waterways). Build the capacity of outdoor staff to recognise the negative impacts certain work practices can have on biodiversity and to modify their work practices to protect and enhance biodiversity. Encourage officers to be proactive in identifying potential problems and solutions and to communicate this information to other staff and supervisors. To help build internal relationships between indoor and outdoor staff, including day labour, supervisors and environmental officers. The first phase of the project involved researching and collating examples of training already delivered to council employees in Sydney and NSW. A training consultant was engaged to develop the workshop format and deliver two trial workshops. The workshops were held during August 2010, to coincide with the quieter winter season for most outdoor operations. Participants were encouraged to talk about their own experiences and share their advice. Overall the workshops were enthusiastically received by the staff who participated. They identified where they could improve their practices and intended to adopt these changes in the field. In May 2011 a complementary breakfast was held with open space and recreation managers from 7 councils and one state agency within the Parramatta River catchment. Attendees received a briefing on the content of the workshop resource with opportunities to ask questions and discuss benefits of future biodiversity awareness training. Longer term it is anticipated that council’s will continue to deliver the program to all outdoor staff. 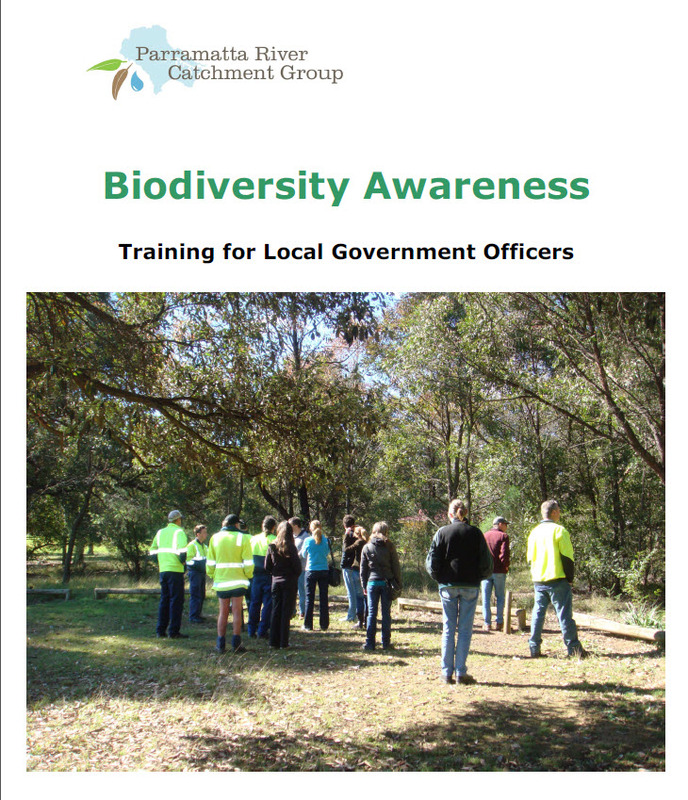 Many of the issues covered in the Being Aware About Biodiversity training program are universal and relevant for most local councils and agencies managing natural areas. One of the benefits of the workshop resource is its flexibility so that it can be adapted by local councils to suit their needs and priorities. For example, it can be adjusted for councils that have large bushland reserves, highly urbanised areas, remnant native trees in parks, river foreshores etc. This training resource is now available for any council or organisation to use and can be downloaded for free below. The PRCG requests acknowledgement for the use, reproduction and modification of the information contained in this resource. A series of labels have also been developed to reinforce some of the key messages from the training program. These are available for councils and other organisations to use on mowers, chippers, equipment storage sheds, council vehicles including ute trays and trucks, and other relevant sites where outdoor staff undertake works. An example of the labels is provided below.